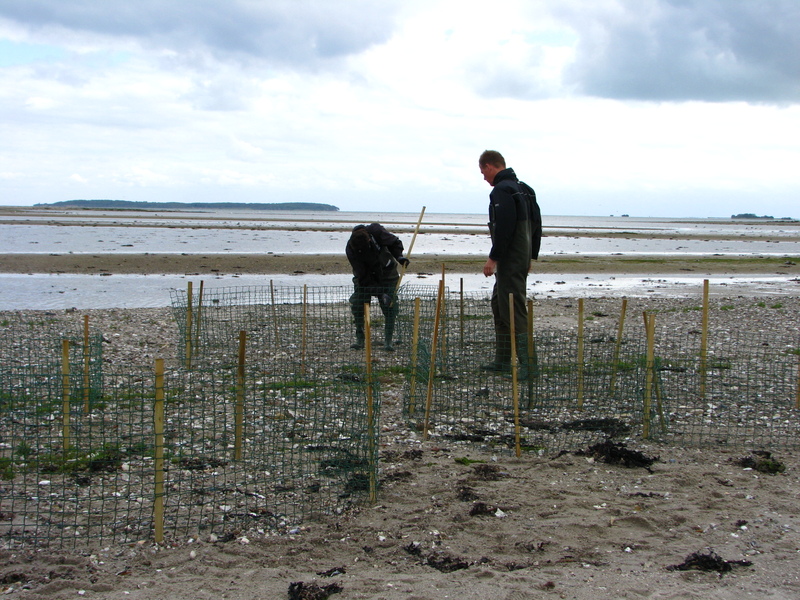 With special permission for a scientific project we met at the shore line, donned some fetching green waders, ate the obligatory cake (we are in Denmark!) and headed for the water. We had to wade out to the islands and bring all the necessary equipment with us. We luckily had two small fishing boats/kayaks that helped a lot! Walking through the water (above knee height) was good exercise to say the least and we were all relieved to reach dry land again! The first task was to divide the group into teams. Each team had two ringers, a scribe and a bird weigher. 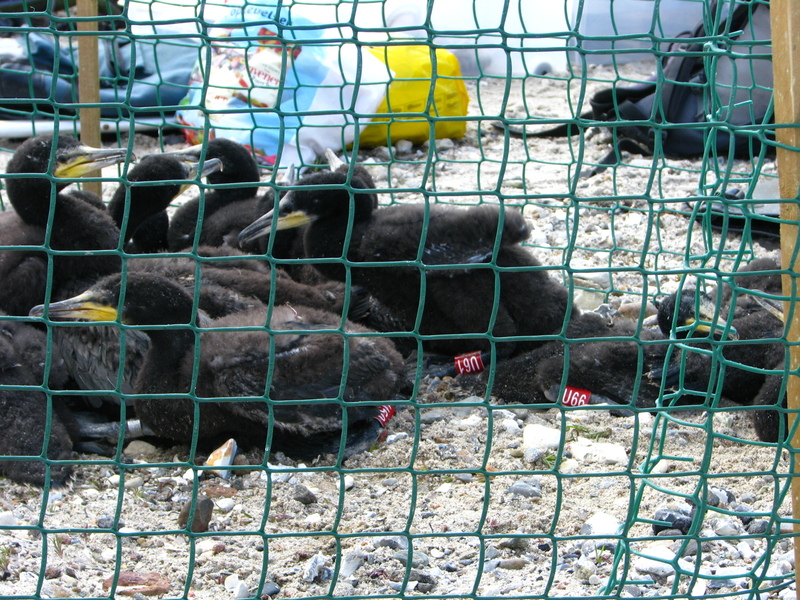 Once in teams we set up some small pens or enclosures which would temporarily house the young cormorants while we ringed them. With everything prepared, all we needed to do was catch the birds! 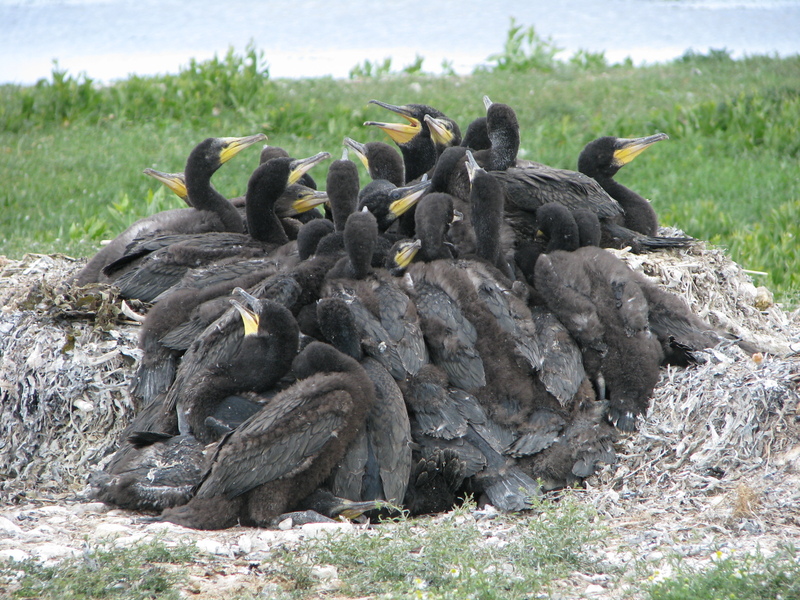 Cormorants nest in colonies of around 20 nests (from what I could see) which makes catching them a little (not a lot) easier. 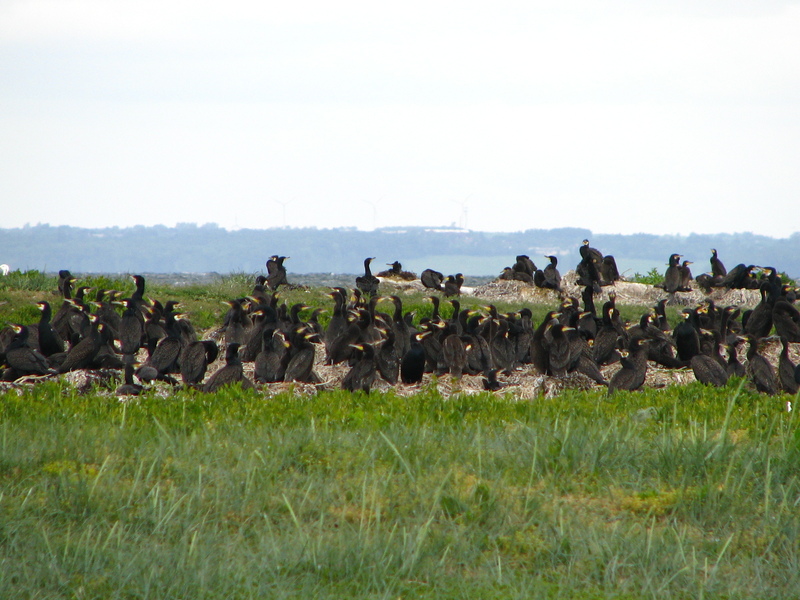 When we approached the colony the adult birds had flew off, leaving the juvinelles of varying ages. We only ring the older ones, who incidentally are more difficult to catch! We formed a large circle around the colony and slowly closed in. This forced the birds into a huddle (most of them!) 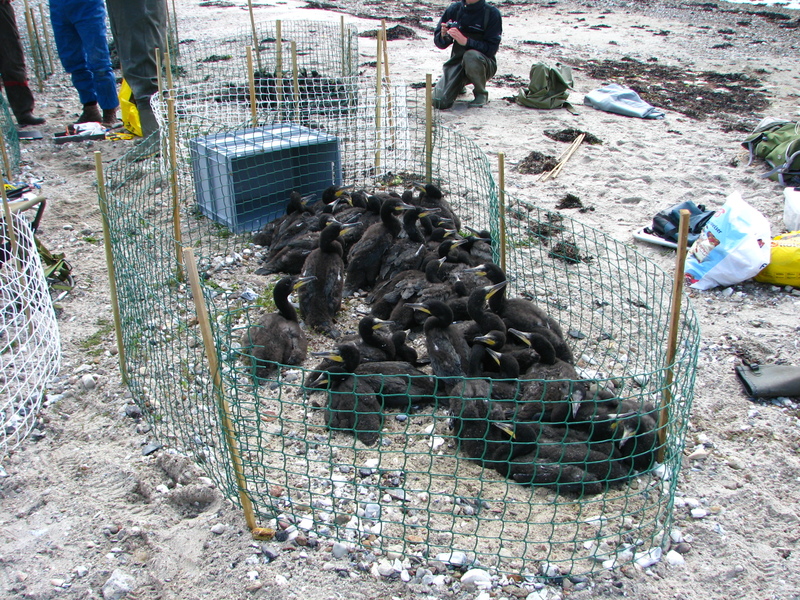 and we carefully caught them one by one and placed them in containers to be carried back to the ringing area. 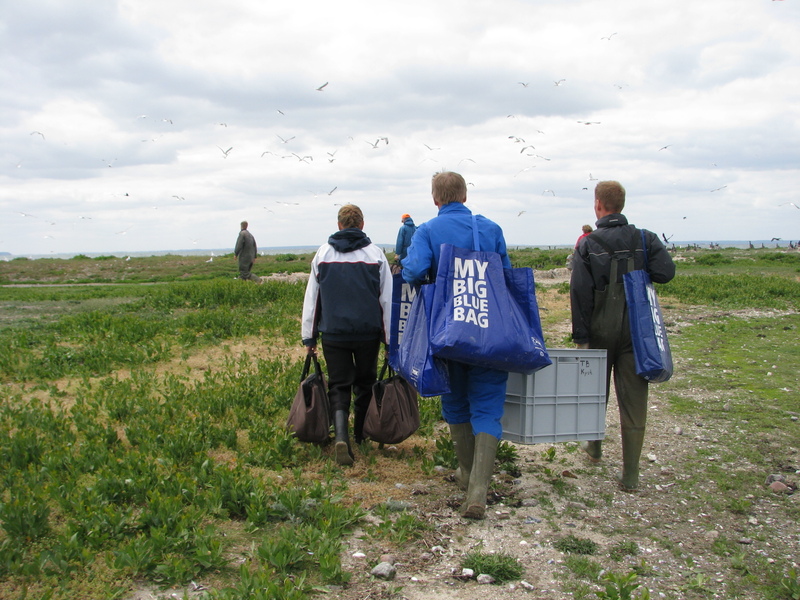 Once back at the ringing area the processing began. The young birds were given two rings, one on each foot. A metal ring with a long number and the details of the Danish Zoological museum and a large coloured ring (red) with a code which can be read from a distance (they are water birds after all!). Once ringed, the wing length was measured and the bird was weighed. All the information was carefully written down. Unfortunatly they are not the easiest birds to handle. They have sharp beaks and know how to use them! I was lucky as I could do my part (the weighing) with gloves on. The ringers had to be bare handed, and there were some injuries – thankfully only minor. Cormorants are strong and continually trying to escape and for those of you that haven’t been lucky enought to get up close and personal with a cormorant, they stink! When we approached the island, the smell was unmistakable! But after the first hour, it faded and I began almost to like it! 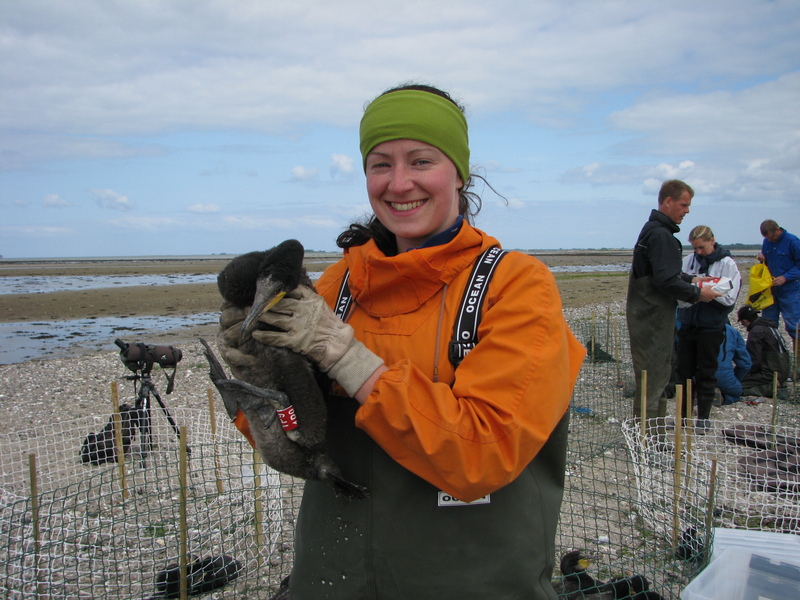 Once the cormorants were ringed we carefully returned them to their colony and the adult birds returned once we were far enough away. We ringed three colonies of birds and it was hard work! Being by the sea, in the wind and the sunshine always takes it out of me. Thankfully we had a good supply of chocolate to keep the spirits high! It was really interesting to see the birds up close, to see their nests and understand more about their lives. I look forward to the next ringing experience, smelly or not! Everyone loves the sound of birds singing. It means so many things to so many people. For me it represents the start of a new day, filled with countless opportunities. I am currently reviewing a bird identification course I did last year with the BTO. 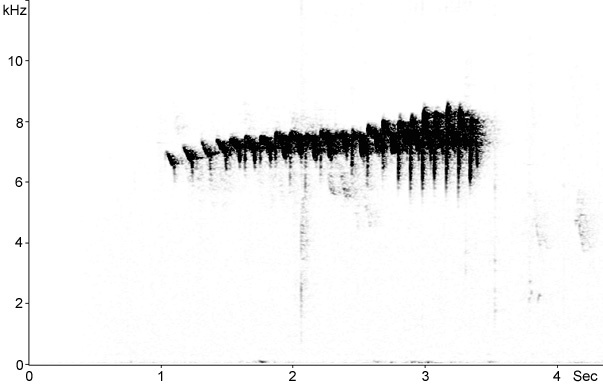 With the last years experience under my best I have become more interested in the technical side of bird song. When you begin to attempt to learn bird song it is truly a huge challenge. Where do you even start? There are tips and tricks you people can share with you to help you remember, but something which may appeal to some is the more technical side. Physics was never a strong subject for me, but if I can apply technical knowledge to something real, usually I can grasp it. If a bird’s song is recorded on a sonogram it can be visualised. The changes in the sound are reflected in changes in a graph of frequency (kHz) versus time (seconds). Using this visual image one can then identify the characteristics of the song. To start with you can figure out if the bird is singing in a high or low-frequency? For example a wood-pigeon (ringdue), which most people will be familar with sings in a very low-frequency (think double bass!). You can listen here. While the firecrest (fuglekong), a very small song bird sings in a very high frequency. You can listen here. Also you can identify if a song is simple or complex. The chiffchaff (gransanger) has a very simple song while members of the warbler family (like the blackcap or munk in Danish) have very complex songs with many variations in frequency. The sonogram images from this excellent website, where there are many more, if you would like to try and figure a few more out! Who knows, it might just help!